Multi-cultural Brent is a great choice for tenants looking for a vibrant location with easy links to central London. Rentify can help you make the most of your letting with our handy borough guide. At Rentify we have property specialists dedicated to Brent, armed with local expertise and unmatched valuation knowledge to find you the right tenants. Hugely ethnically diverse, Brent is a melting pot of different cultures, giving a real buzz to the borough. The stunning BAPS Shri Swaminarayan Mandir Hindu temple is one of Brent’s key landmarks, as well as iconic sporting venue Wembley stadium. Local residents are also spoiled with one of London’s largest entertainment venues, Wembley Arena, nearby. For those looking for something a bit more low-key, Fryent Country Park offers over 100 hectares of meadows and woodland. Alternatively locals can enjoy a walk along the historic Grand Union Canal where there are plenty of trendy cafes and bars to stop at along the way. Transport-wise, Brent is very well connected with access to Jubilee, Bakerloo and Metropolitan tube lines, as well as Overground and National Rail services. Housing stock in Brent is predominantly flats, with a decent amount of terraced and semi-detached houses too. 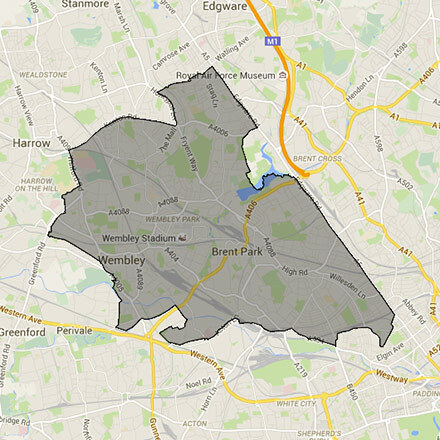 Brent's many districts each have their own character, catering to a variety of residents. Here's our top picks for new landlords in the area. This borough covers the HA0, HA1, HA3, HA8, HA9, NW10, NW2, NW6, NW9, W1 and W9 postcodes. Rentify uses proprietary methodology for data collection and processing. Borough data is collected from Rentify's property database and external public sources.